This lovely blanket set features two super soft blankets to help keep baby snuggled and cozy. The two ply receiving blanket measures a generous 29 by 38 inches. It has soft plush fabric on one side and a textured fabric on the other side decorated with either pink dots or blue stars depending on the boy or girl�s version ordered. 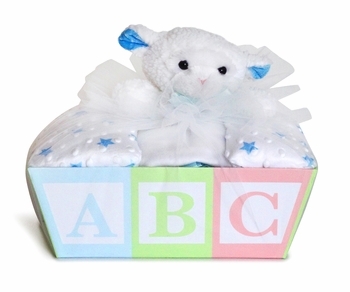 The little lamb security blanket measures 22 by 15 inches. Perfect for hugging, it features super soft plush fabric with a little plush lamb head in the center and surrounded by satin trimming.